Although dementia can affect a person’s memory, it can also increase their risk of experiencing falls. As dementia progresses, a person’s ability to walk or move diminishes, which eventually turns sturdy steps into more of a shuffle movement. 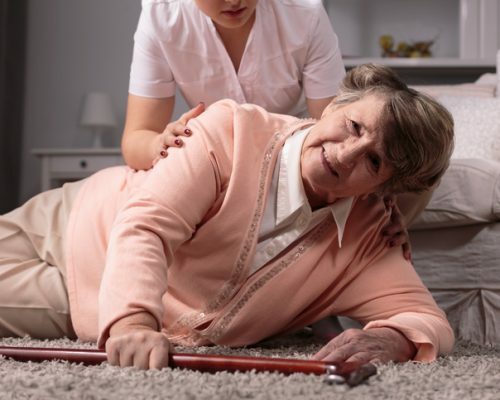 The risk of falling increases if there are obstacles (such as rugs or objects) in a patient’s way, so it’s important to remove any potential cause of fall. Statistics show that every year 30 percent of seniors fall, but the rate is much higher among seniors with dementia. Dementia can negatively impact a person’s perception, meaning they may not properly take a step or may be unable to notice objects or people in their peripherals. Furthermore, anxiety due to confusion can worsen the risk of falls. Having a fear of fall can add to the confusion and instability as well. Physical weakness: Changes in gait and balance can occur in dementia patients even if they are in excellent physical condition. Some researchers believe that these changes that occur early on are one of the first indicators of dementia. As dementia progresses, this weakness progresses, too, declining muscle strength, walking ability, and balance. Lack of physical exercise: If a person lacks physical strength, meaning they were already quite weak prior to diagnosis, this can increase their risk of falls. Memory impairment: Memory impairment can affect a person’s risk of falling because the person may not remember that they were told not to get up or move around. They may also not remember that they are now weaker and that their ability to move is limited. Because of cognitive issues, patients may not be able to recognize that they cannot simply get up and go any longer. Poor judgment: Poor decisions can lead to falls. For example, a patient may step on ice or go out alone even though they need assistance. Visual-spatial problems: A patient may misinterpret their surroundings, so they misjudge steps, uneven terrain, and other obstacles that may cause them to fall. Clutter: In cluttered areas, a patient may trip or bump into objects in their way. Or, they may fall on a rug that is not well placed because they cannot determine that it is a hazard. It’s important to clean up living spaces and avoid clutter as best as possible. Fatigue: The risk of falls may increase prior to bedtime because the patient is fatigued. Medication side effects: Certain medications may increase the risk of falls as well as a result of side effects such as orthostatic hypotension where a person experiences a sudden drop in blood pressure making them dizzy upon getting up. Other contributing factors for a greater risk of falls in dementia include restlessness, discomfort or pain, hunger or thirst, bathroom urges, boredom, and loneliness. Medical risk factors that can increase the risk of falls in dementia include depression, Parkinson’s disease in dementia, Lewy body dementia, orthostatic hypotension, peripheral neuropathy, osteoporosis, and older age. Have a family member or a friend come to take a “fresh look” at your home – they may point out an obstacle you hadn’t identified, such as a throw rug or cable on the floor, which might cause you to trip. Replace light bulbs to provide you with good lighting in all the rooms, staircases, and hallways that you use. Make sure your prescription lenses have been recently upgraded by your ophthalmologist. Avoid bifocal lenses, unless absolutely necessary. Rearrange your furniture so that your most needed items are within an easy reach from your favorite chair. Consider having an occupational therapist advise you on how to safe-proof your home with grab bars and non-skid equipment. Get a Life Alert system to summon help in the event of a fall. Read side effects listed on medication bottles.